On couches across the U.S. on any given evening, millions of dogs curl up next to someone watching TV - a pretty ordinary occurrence. But when Byram, a black-and-white mixed breed pooch, would sit on Candido Santiago's bed, barking at the Giants while Santiago cheered the footballers on, it was a decidedly atypical arrangement. Rescuers had recently saved Byram from life as a stray, and Santiago, his foster and trainer, was nearing the end of a decade in prison. The duo was part of a program called Don't Throw Us Away, which pairs nonviolent inmates with stray and abused dogs. Santiago and Byram are among those profiled in "Dogs on the Inside," a documentary that debuted Tuesday. 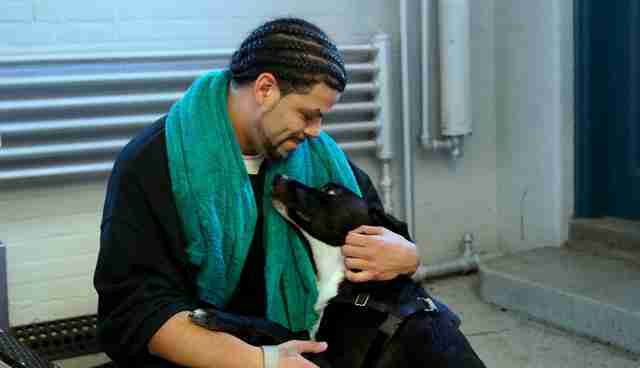 Santiago was one of the first inmates to raise dogs at a low-security prison in Springfield, Massachusetts. "I signed up thinking I'll have someone to talk to," Santiago, now released from prison, told The Dodo. "I didn't know, at first, how deep it was." Santiago prepared six dogs for life off the street, spending roughly three to four months with each stray. Under guidance from professionals, he offered the troubled pups obedience training, but also unconditional love. 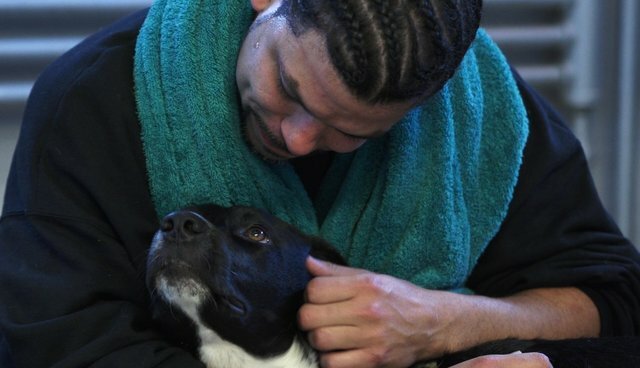 Inmates and abandoned dogs are two forgotten parts of society, filmmaker Brean Cunningham told The Dodo, but the inmates act as natural narrators for the voiceless animals. Cunningham, along with Douglas Seirup, directed "Dogs on the Inside." As the inmates help the dogs, so too the dogs help the inmates. "They're released in a much better state of mind," Cunningham said. Prison life doesn't simply cut inmates off from the world by chain links or bricks, but by what Santiago calls invisible barriers. "Inside, there's no laughter, there's no kids, there's no family, there's no friends," he said. "You can't even trust the guy you're living with." But throw dogs into the mix, and the invisible walls crumble. "You had people who were gang members, on opposite sides of the line, so to speak," Santiago said. The gang members in the dog-training program ended up chatting - an almost unheard of phenomenon. Their favorite subject of conversation? Dogs. It's unclear how many programs like Don't Throw Us Away exist, the filmmakers said, though there are several scattered throughout the U.S., from Arizona to New Jersey. "They've been popping up since we started filming over three years ago," Seirup said. About 50 dogs have been trained and adopted through Don't Throw Us Away since its founding in 2011. The program recently shifted away from inmates to at-risk youth, but Santiago and the filmmakers believe that similar organizations deserve to be in prisons across the country. The potential - and need - for these initiatives are immense. There are roughly 3.9 million dogs who enter shelters each year, not counting the animals who are turned away, and roughly 1 million inmates serving sentences for nonviolent crimes. Santiago, who would "gladly take on maybe five, 10 dogs" as soon as his living situation allows, said the program sparks second chances. "It gave me hope," he said, "and it can give the next man hope too." "Dogs on the Inside" is available for streaming on Amazon Instant Video, Google Play, iTunes and Vudu, and at dogsontheinside.com.